As I’ve found with many peaches this summer, the flavor just isn’t there. Blame it on the wet June or the heat wave in early summer, or both. I’m not sure what the cause is but a lot of produce just doesn’t seem to compare to last season. Corn, tomatoes and peaches in particular. I’ve probably only consumed two or three peaches plain this year. The rest have been put up or cooked with something to draw out their sweet flavors. These peaches were no exception. In the effort to simplify my cooking I decided to play with a classic bananas foster recipe, just switching out the bananas for peaches. 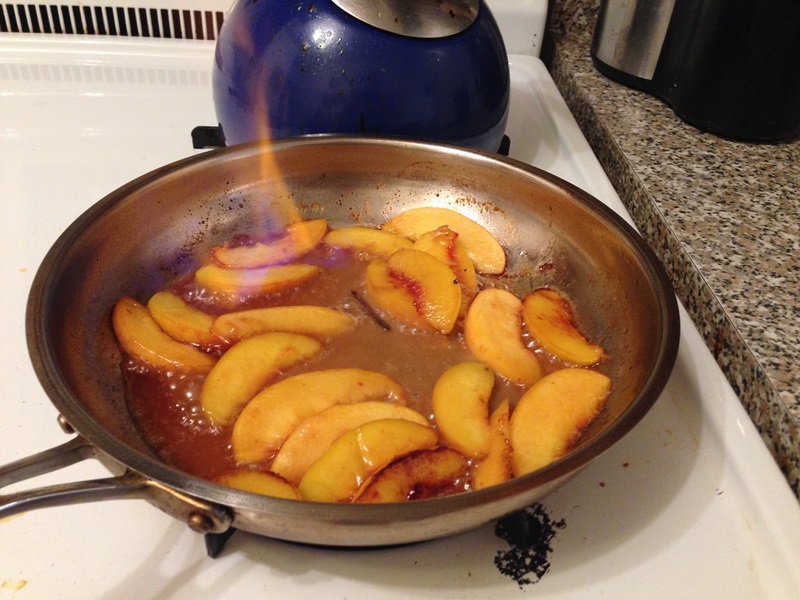 Let’s just say peaches with rum and a bit of fire go nicely together. In a large non-stick frying pan, melt butter over medium heat and allow to brown slightly. Add peaches and sprinkle with sugar, cinnamon and salt. When sugar has melted, pour over rum. Swirl dish so rum evenly covers all fruit. Strike a match and toss it into the pan (be careful!). The pan should ignite. Remove pan from heat and continue cooking until fire has extinguished itself. 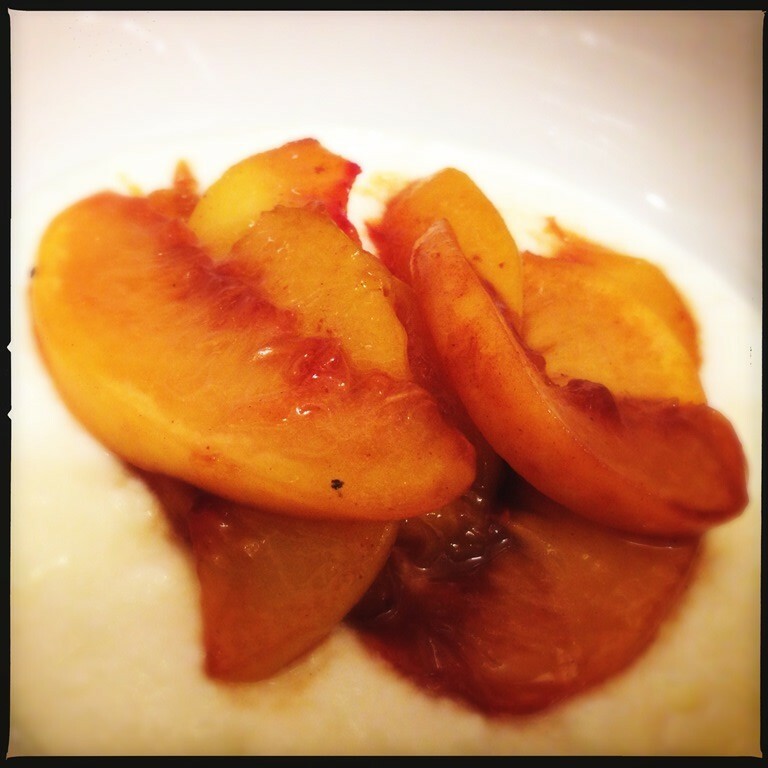 Spoon peaches and sauce over vanilla ice cream (for dessert) or plain yogurt (for a boozy breakfast). Next postWeekly Photo Challenge: Good Morning! Yummy addition to yogurt or ice cream for sure. I agree re the lackluster taste of peaches this summer, but a few times I did have great luck with peaches I got from Trader Joe’s that were quite delicious. It’s so disappointing to bite into a beautiful peach and find out it tastes like … paper practically! So true. It’s interesting to see how different peaches from different areas taste. For the most part I think the farms I shop at the markets are NJ or Hudson Valley-ish and have been subpar. However, the ones I’ve been getting from my CSA, based about an hour north of Albany have been pretty fantastic. I blame it all on the crappy June. Hopefully next summer will treat us better! Yummm… going to miss my peaches and nectarines and I only froze one bag of them. I would love these over ice cream!! I have about 5 jars of bourbon peaches plus some plums, but I imagine those will go fast. Count down til next summer!